Today my MOVE EVERY DAY group is celebrating the half way point! We've been moving more every day for the month of September. We are learning new ways to get started on a healthier journey and motivating each other daily to keep going. Want in the group? Leave a comment with an email, find me at my office, Coach SusieQTpies or email me at susieqtpies@beachbodycoach.com and I'll let you know when the next one starts up! My group will share recipes that are on the healthier side. I know that I don't need any extra temptations this week to make something not so healthy! Below are 2 recipes for Pumpkin! Pumpkin season is going full force! 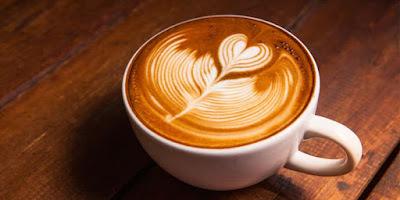 The warm version has half the calories as your typical latte and the cold version is so healthier you won't even realize it is a meal in a glass! I'll share some of our favorite healthier recipes again this week! So stop back in! Enjoy! Remember if you want more info on the MOVE EVERY DAY GROUP or our HEALTHIER EATING group email me or leave a comment with your email. We will be starting up new groups soon! 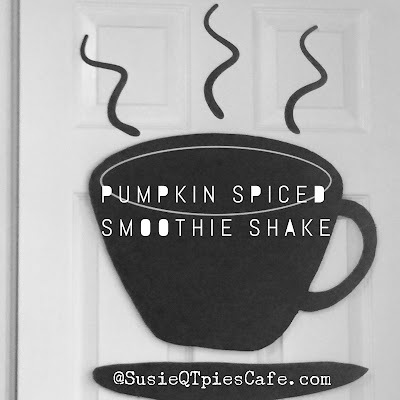 This is the healthier version aka way less sugar of the typical pumpkin spice latte. This one has half the calories of your favorite pumpkin fall treat. Thanks to Beachbody for sharing the recipe. 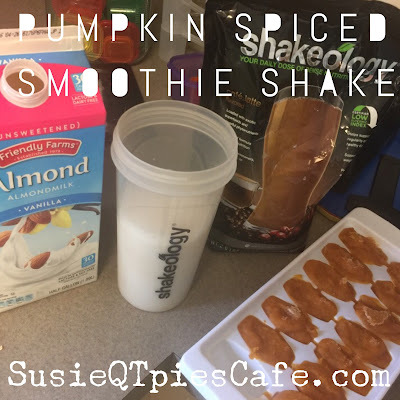 Pumpkin Spice Latte - counts as 1 yellow with the 21 Day Fix! 1. Add all ingredients to a shaker cup and shake. Drink up! 2. Optional directions include adding all ingredients to a blender and blend! Drink up! 3. Optional directions include freezing the pumpkin and spice mixture in ice cube trays. Then add that to your shake 3-4 cubes. You can still hand shake or blend in a blender.